Fairy Tale Hello Kitty McDonalds Malaysia Craze? 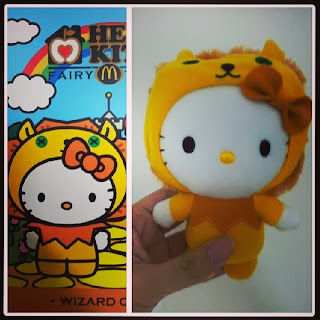 The one that I bought is the Wizard Of Oz Hello Kitty character. Hello Kitty is dressed up as the lion who in the story continues to the journey with Dorothy to find the Wizard of Oz to get his courage. When I went to McDonalds, there were no shortage of toys. They even let me to pick which character I want. So far there are other 2 more characters that is out into the market. Damn, I should have ask them whether I can buy one McValue Meal but buy another one Hello Kitty to complete the collection. Regret or regret. Nevertheless, I see that the upcoming 28th Nov Hello Kitty offering is very nice & cute. Hello Kitty in Red Riding Hood attire :D Going to buy that also. In the end, McDonald as usual is going to make alot of money $$$$ with these plush toy promotions. And for us, especially guys (I have yet to know any guy that collects Hello Kitty dolls ^_^), hopefully this going to make someone really appreciative and happy. Wah @ChampDog?? you play with dolls? ...lol..